Not only are the Cubs and its fans getting ready for the MLB postseason, so are its attorneys. 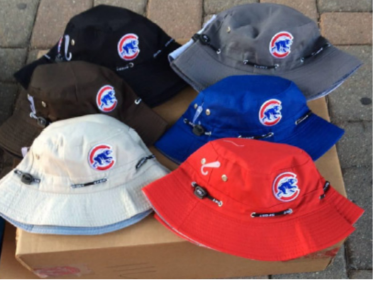 Yesterday, September 22, Major League Baseball and the Cubs brought a lawsuit for trademark infringement, counterfeiting, copyright infringement and a slew of other intellectual property claims against a number of sellers of alleged infringing Cubs gear. The twist, this suit heavily focuses on vendors who sell the allegedly infringing wares outside of Wrigley Field during Cubs games. The attorneys here moved fast too; most of the photos of the defendant vendors were taken last week. …some arguably are works that might fall outside of these claims, like the below shirt. 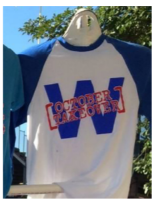 For those confused on why the above is part of the suit, the complaint takes issue that the shirt has a W (for the Wrigley Field win flag) and a mention of October (which calls to mind the World Series). I think this is an overly broad interpretation of what the Cubs/MLB intellectual property should control (even though the Cubs do have a trademark registration about to issue on a "W" for clothing), and would be fun to litigate…but given the defendants here likely don’t have the deep pockets of the Cubs or MLB, it likely will not be. 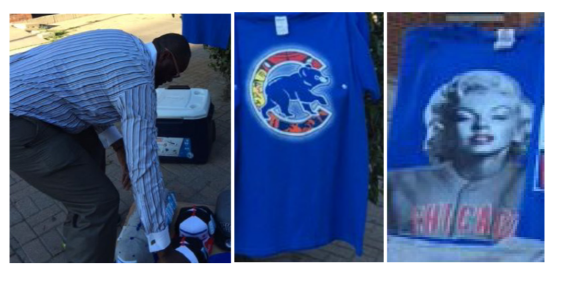 Also, while the lawsuit seeks damages from the defendants, it would not shock me if the real goal here is to just shut down these (and other) vendors around Wrigley prior to the playoffs. Still, the ultimate message of this lawsuit is clear: make anything that arguably looks like the Cubs’ logos or trademarks without a license, and we’ll come for you.